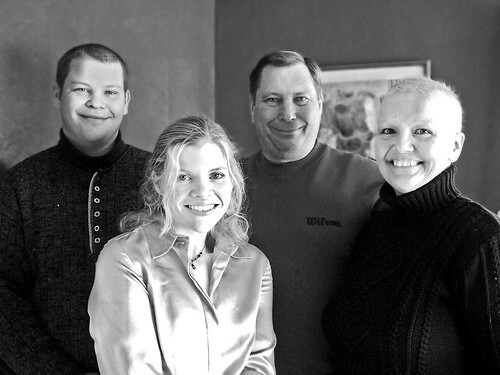 So, Cancer…it was nothing more than a word, an idea…not until Mom was diagnosed. These pictures were taken on the morning of her last Christmas in 2005, one month before she passed away. I remember a lot of things about that Christmas, and not many of them good. I remember the heaviness in my chest and the feeling in my gut that time was running out. Yet, I look at this picture of Mom, who must have felt the same things, and there is a brightness to her smile and a sparkle in her eyes that none of the rest of us had. We all look empty by comparison...fake smiles and vacant eyes staring back into the camera lens. Mom was happy to be alive just for that day, while we were all hung up on the days ahead. I could say that it's an appreciation that grows when one stares death in the face, but that's just the way my mother was. Appreciative...happy to be breathing the same air as her children...absolutely in love with life. I felt so blind-sided by the entire situation, not least of all because I knew nothing about Cancer. I had remained blissfully ignorant of the disease until Mom called me on that clear, sunny, North Carolina afternoon with the results of her medical tests. The lights in my world dimmed instantly. But legions of people across the world are working to fight the darkness that grows from those three small words: You have Cancer. February 4th is World Cancer Day. I think it's about time that we take "Cancer" off the taboo discussion list. When I took out my first life insurance policy a decade ago, the actuarial research showed that one in three people was expected to contract the disease in some form during their lifetime. The prominence of Cancer can only have grown since then...so that's more than one in three. Let that sink in a second. More than one in three people will contract Cancer at some point in their life. Just think of the strength of numbers if all of them, all of their friends, and all of their family banded together to change the course of this disease? There is power in knowledge and value in time...both are what we need to defeat this enemy once and for all. I hope that one day we can all meet during the survivor lap.